I can't believe what I heard outside this evening....Peepers. The small frog that makes music to sleep by during the warm Spring and Summer months. I can't remember hearing them much before May. I am not sure if anyone else remembers hearing them this soon. The temperatures have been as high as 80 during the day and staying above freezing at night has taken all the ice and snow off the mountain. The animals are singing sounds of Spring and to the woe of many turkey hunters the Turkeys are mating very early. I expect some even going to nest soon. The Turkey Vultures have returned along with the robins, blue Jays and geese. The porcupines are moving around a lot as well. So keeping an eye on my quill collector dog Leo is now a must. While working down at Cedar Run near the Creek I saw several people enjoying the summer temperatures canoeing down the creek. I wanted stopped my work to join in the fun. If you want to hear one click here Mountain girl Paula logging out and enjoying the warm weather. 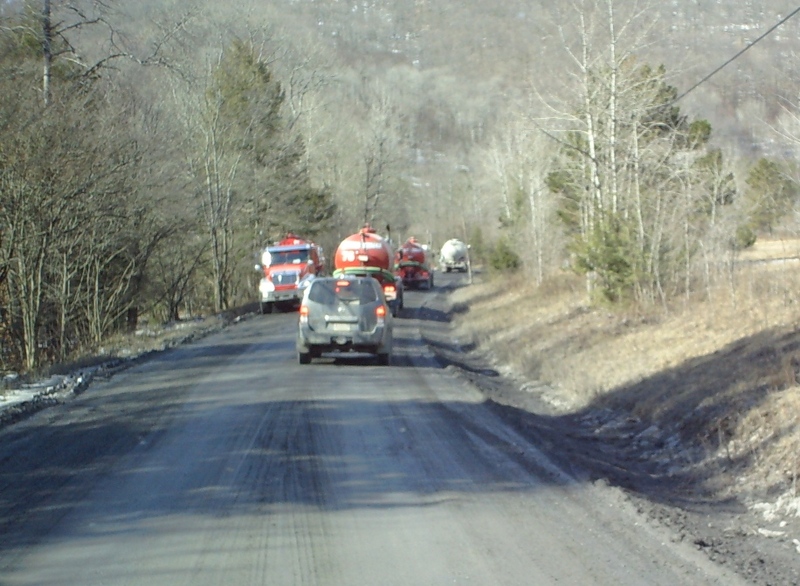 With the weather getting warmer the amount of water truck traffic seems to be increasing on Pigeon Hill and Button Hollow Rd. 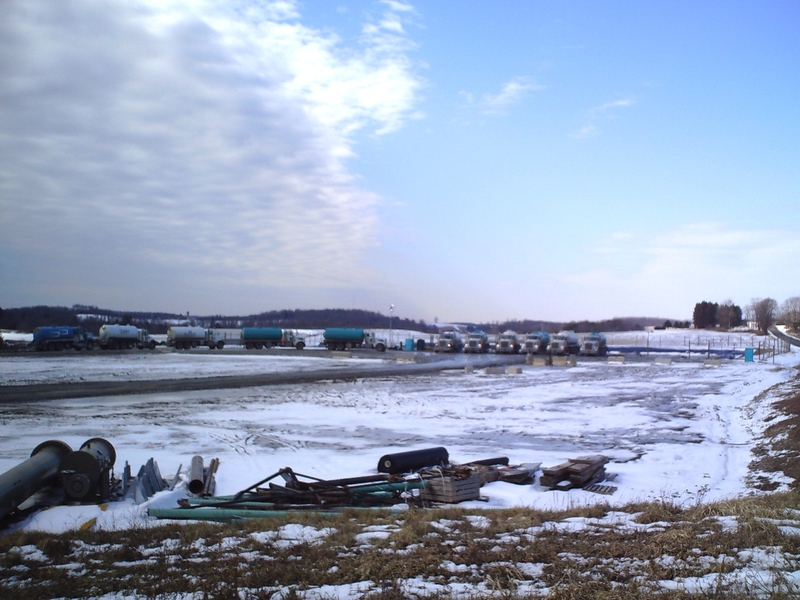 You can see from the first picture how many trucks are filling up with water to be hauled as far away as Mansfield. 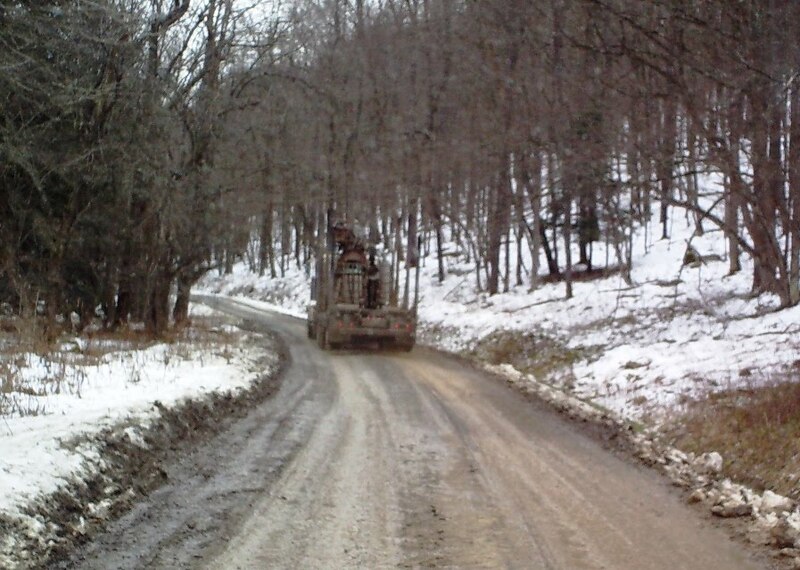 The second picture shows me following the trucks down Button Hollow Road a slow process. 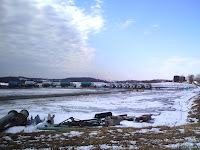 I often see as many as six trucks on the one mile stretch. The traffic makes me fell like I live in an industrial zone, instead of being on a quiet country road. The third picture is a logging truck heading up Leetonia Rd. This is the same guy I had to back up a mile and a half for when the road was snow covered and narrow. He was headed toward me at that time and loaded with logs. I can tell you it isn't fun backing up a narrow, icy, snow covered road a mile and a half. The roads are for the most part around 90% melted even on roads not plowed. 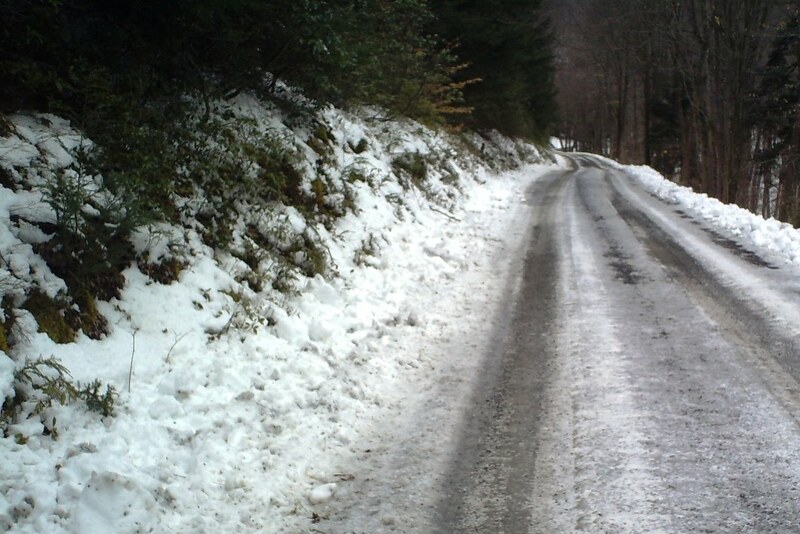 However, the 10% still ice covered can be tricky when the temperature drops below freezing. So my warning of having chains with you if you are going off the plowed roads still holds. my front porch. Looks like I will be in good shape for next year as I doubt I will touch too much wood on back porch to get through to summer. Lee Anne came home yesterday from helping her sister who has a son with leukemia. Unfortunately, the prognosis for him is not good and it was hard for her to leave. It is hard to see a boy who is only 18 deal with his own mortality. On the selfish side, I am glad to have her back it has been a long lonely winter for myself and the dogs. Mountain girl, Paula, logging out.